This section provides an overview of the key features of the Child Support Scheme that are likely to affect labour supply decisions of those receiving child support payments, and discusses some of the reasons why the receipt of child support may affect these decisions. Under the Child Support Scheme, a formula is used to calculate the amount of money that a non-resident parent is required to pay. This is determined by a number of factors, including: the number of children for whom a parent is liable to pay child support; the income of the payer (capacity to pay); whether the care of children is shared or divided between parents; the income of the resident parent, the child support payee (above a relatively high income threshold); and whether the payer has dependent children from a previous or subsequent relationship. If the resident parent re-partners, child support payments are not affected by the income of their new partner. The discussion of the Child Support Scheme in this section is based on the 2004 policy settings, the time at which the initial wave of data used in this report was collected. There were no significant changes to the child support formula between 2004 and the second LSAC data collection in 2006. Under the child support formula, child support payments are calculated as a percentage of payers' taxable income less an amount of exempt income that is set aside so that payers are able to support themselves.1 This percentage increases with the number of children being supported, up to a maximum of 5 children. In families in which the resident parent provides sole care, the child support percentages are 18% for one child, 27% for two children, 32% for three children, 34% for four children and 36% for five or more children. Where the care of the children is shared between the parents (30-70% of nights with each parent) or each parent has a child living with them, a modified child support formula is applied. In this case, each parent is entitled to child support from the other parent. Where a parent is liable for a "part" of a child, the percentage of income payable is taken from a sliding scale based on the amounts payable for whole numbers of children. The child support liability is calculated for each parent and then offset against one another. The reduction in the child support percentage is intended to reflect the costs associated with the care provided by the non-resident parent.2 For example, if there is one child support child who spends 30-40% of nights with one parent, then the child support percentage applied to their income falls from 18% to 14%. The other parent with 60-70% of the care of the child has a child support percentage of 8%. In the case of having care for 40-60% of the time, both parents have a child support percentage of 12%. In the case where the child spends 30-70% of nights with each parent and the modified child support formula is applied, the amount of child support that is required to be paid still increases with the payer's income and the number of children. From the perspective of understanding the impact of child support on labour supply, the same basic structure of incentives applies as in the case where the mother has sole care. Where the payer has had subsequent children from a new relationship and the children are living with the payer, the costs of these children are recognised by increases in the self-support amount above which the child support percentages are applied. This is increased further depending upon the number and age of payers' dependent children. Dependent children may include eligible children of a child support assessment where a shared care arrangement exists in relation to the eligible child. Children from past or subsequent relationships are also counted as dependent children for the purposes of the child support assessment; however, in most circumstances, step-children are not. Two other aspects of the child support formula that are relevant to the labour supply incentives created by the Child Support Scheme are the payer income cap and payee income disregard. The payer income cap places a ceiling on the amount of the payer's assessable income, equal to 2.5 times the annual equivalent of average weekly earnings (AWE)—$126,659 in 2004. The child support disregard of $38,168 per annum in 2004 has the effect of reducing the non-resident parent's child support liability where the resident parent has assessable income in excess of this amount. The effect of the disregard is to reduce the adjusted income (taxable income less the self-support amount) of the payer by 50 cents for every additional dollar of the payee's income in excess of the disregard amount. The child support liability of the parent cannot however be reduced to less than 25% of what would have been payable in the absence of the disregard. It is important to emphasise that the resident parent's income has no impact upon their child support entitlement where their income does not exceed the disregard amount, provided the non-resident parent has less than 40% of care of the eligible child. There are a number of other factors that may affect child support payments but only apply in limited circumstances or are not relevant to understanding the impact of child support payments on the labour supply decisions of resident mothers. These aspects of the formula are therefore not discussed in this report. Separated parents will be registered with the CSA if either parent makes an application to the CSA for a child support assessment. Parents can choose whether to have child support paid via private arrangement between parents ("private collect agreement"), or have it collected from the non-resident parent by the CSA and paid to the resident parent ("CSA collect agreement"). According to the CSA's administrative data, 48.2% of child support cases registered with the CSA were CSA collect cases; the remaining 51.8% were private collect. Alternatively, separating families may determine the amount of child support to be paid without reference to the child support formula and may not register their agreements with the CSA. Some parents enter into an entirely private agreement through negotiation. Others may arrive at an agreement through legal proceedings in the Family Court of Australia. Indeed, some parents will not have any child support agreement, instead relying on ad hoc financial or in-kind support. The CSA terms both of these types of arrangements "self-administration" (CSA, 2004). Data from the CSA (2004) suggest that the majority of cases registered with the CSA used the child support formula as the basis of determining child support payments (92.3% of CSA collect cases and 94% of private collect cases). Just 0.4% of CSA collect cases and 0.2% of private collect agreements were made via court order. It is clear that the child support formula is highly influential in determining the child support liabilities of parents who enter into these particular child support arrangements. Furthermore, it is likely that the child support formula influences, at least to some degree, the amounts of child support negotiated by parents who decide to enter into private agreements. This section highlights several features of the Child Support Scheme that are important in understanding the likely impacts of child support on the labour supply of resident mothers. the payee has not re-partnered. There are two key points to be taken from Figure 1. Firstly, the effect of an increase in the non-resident parent's income on the amount of the child support payment is to increase the amount of child support for every amount of resident parent income (a vertical shift). Second, an increase in the resident parent's income reduces their child support entitlement once their income exceeds the disregard amount of $38,168 per annum.8 If the father is receiving NSA and hence paying the minimum child support payment ($260 per annum), then the resident mother's income does not affect the amount of child support they are entitled to receive. 2 times AWHE ($43.20 per hour). The non-resident parent is assumed to earn median male weekly total earnings ($41,236 per annum). Figure 2 shows how the amount of child support the resident mother receives as the number of hours she works increases and how this varies according to the before-tax amount that she earns per hour. For mothers earning the minimum wage, the amount of child support she is entitled to receive is unaffected by the number of hours she works, even where she works 80 hours per fortnight. For mothers earning AWHE, their earnings exceed the payee disregard when they work 68 hours per fortnight, and earnings in excess of this amount reduce the amount of child support the resident mother receives. 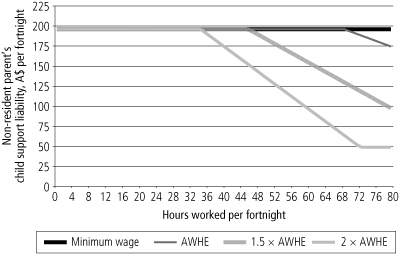 At AWHE, each additional hour worked in excess of 68 hours per fortnight reduces the amount of child support they are entitled to receive by $1.94. For mothers earning twice the AWHE, child support payments are reduced once hours worked reach 35 hours per fortnight. The impact on the amount of child support received can be fairly significant for mothers working long hours and receiving a relatively high hourly wage rates. At this level of earnings, each additional hour worked in excess of 35 hours per fortnight reduces the amount of child support received by $3.89. The impact of child support payments on labour supply decisions will depend, in part, upon their overall contribution to household income. One way of assessing this is to compare the value of child support payments with the amount of Family Tax Benefit (FTB; Part A and Part B) that families receive. For a mother receiving the maximum rate of FTB in the financial year 2004-05, the amount of FTB received for a mother with one child aged less than 5 years was about $270 per fortnight (Ministerial Taskforce on Child Support, 2005). If the non-resident father had a median income of $41,236 per annum and did not have a second family, then the amount of child support payable was $196 per fortnight. The application of the Maintenance Income Test reduced the amount of FTB received by about $65 per fortnight, leaving about $205 of FTB per fortnight. In cases where the non-resident parent had median earnings, child support payments were of a similar magnitude to the amount of FTB received. Gray and Chapman (2007) provided estimates of the importance of child support to the household incomes of mothers following separation, using a variety of hypothetical examples. 2.3 Why might the receipt of child support affect resident mothers' labour supply decisions? The potential impacts of the Child Support Scheme on the labour supply decisions of resident mothers can be illustrated using the standard microeconomic model of labour supply. Within this model, labour force status is determined in a two-stage process. In the first stage, an individual decides whether or not to supply their labour in the labour market. In the second stage, they decide on how many hours to work in response to the wage offers that they receive for a given number of work hours. An individual makes labour supply decisions by maximising a utility function that determines subjective welfare or satisfaction as it relates to the different quantities of work hours and income. This process of optimising occurs depending on their income or budget constraint, which is determined by the wage rate received per hour supplied in the labour market and government policy settings. An individual's decision to participate in the labour market (and work a desired number of hours) can be explained in terms of their preferences for time spent at home in non-market activities, such as child care and leisure, and the income they can earn from paid work. The decision to work depends on a comparison between the wage that can be obtained in the market and the individual's reservation wage (the minimum wage at which they will accept a job) (Blundell & McCurdy, 1999). An important determinant of labour supply decisions is the amount of income received from sources other than from the labour market ("non-labour income"). Examples of this type of income are government benefits, income from investments and child support payments. Microeconomic theory predicts that an increase in income that is not obtained from the provision of labour will decrease the number of hours an individual offers in the labour market. This behavioural response is what economists term the "income effect" and rests on the assumption that consumption and non-work hours increase one's satisfaction, while work embodies a "psychic" cost relative to time spent in non-market activities. Recent Australian empirical studies found that increases in unearned income have a negative effect on labour supply (Cai, Kalb, Tseng, & Vu, 2005; Kalb, Kew, & Scutella, 2003). Child support payments increase the amount of income that a mother receives for all hours worked. This means that where the resident parent is in paid employment, her total income (from all sources) is increased if there is no change in the number of hours in her paid employment. Alternatively, the mother could achieve the same total income by spending fewer hours in paid employment. Depending upon the individual preferences of mothers for income and non-work hours, some mothers may in fact withdraw from the labour market altogether in response to the receipt of child support. Where the resident parent is not in paid employment, economic theory predicts that resident parents who receive child support income will require a higher wage rate to enter the labour market, as they now have an additional source of income they receive that is not related to the number of hours they spend in paid employment. It is important to emphasise that, in the first instance, we are considering the labour supply behaviour of resident parents who participate in the labour market and receive no child support payments with what their labour supply behaviour might be were they to receive child support (or who receive an increased amount of child support payments). In the second instance, we consider the implications of receiving child support payments for the labour supply behaviour of resident parents who do not participate in the labour market. Both instances are examples of the operation of the income effect. The income effect is predicted to reduce both the probability of employment and hours worked where the resident parent is employed. In addition to the income effect described above, microeconomic theory suggests that an increase in child support payments received by women who have assessable income in excess of the payee disregard will involve a substitution effect. This substitution effect involves women substituting work hours for hours spent in non-market activities as a consequence of the tapering of child support payments. This is a consequence of the payee disregard taper rate reducing the financial returns to an hour worked compared to that which she would receive in the absence of the payee disregard.11 While it is theoretically possible that women who have a strong preference for income may increase their hours of work in response to the taper, it is more likely that this substitution effect will reinforce the reduction in hours that we would expect to observe as a consequence of the income effect associated with the receipt of the child support payment. There are two important implications of the income and substitution effects that arise as a consequence of the design of the child support formula. The first is that for resident parents who earn less than the payee disregard, an increase in the non-resident parents' incomes will reduce the number of hours worked by the resident parents or, for those resident parents who are not employed, increase their reservation wage. For those resident parents who have assessable income in excess of the payee disregard, matters are more complex. Here, an increase in the non-resident parents' incomes will increase their child support entitlement. The likely reduction in hours worked in response to this increase in unearned income has the secondary effect of reducing the resident parents' assessable incomes while simultaneously increasing their child support entitlement. This represents what might be described as a feedback loop that continues until the resident parent settles on a steady-state level of labour supply. In the analysis that follows, we assume that our data are the result of resident parents achieving this steady state. There are several aspects of child support that may mean that the receipt of child support does not have the predicted impact of reducing resident mother's labour supply. First, for many mothers, there is uncertainty as to whether the mother will receive the amount of child support they are supposed to receive and, if they receive it, whether they receive it on time. In addition, the amount of child support the mother is entitled to receive may change due to changes in the circumstances of the payer (such as changes in level of income, having further children). This uncertainty in the amount of child support a mother will actually receive may make her less likely to rely on that income when making labour supply decisions. 1 For child support purposes, “income” is annual taxable income plus certain types of income that may be exempt from taxation. While the Child Support Agency uses the term “child support income” to describe the income used to determine child support liabilities, in this paper we use the term “assessable income” in order to avoid confusion with the amount of the child support payment. 2 For substantial shared care (30-40% of nights), the level of exempt income (self-support amount) of the parent with 60-70% of nights is higher than that for the non-resident parent. If there is equal shared care (40-60% of nights with each parent), both parents are entitled to the same level of exempt income. 3 Detailed information on rates of non-compliance with child support obligations for 2003-04 is provided in the report of the Ministerial Taskforce on Child Support (2005). In 2003-04, 20% of CSA collect payers failed to pay any of the child support liability, 43% paid part of the child support liability, and 33% of payers paid more than the required amount of child support liability. 4 The age of the child has implications for the calculation of Family Tax Benefit Part A and B. 5 Most cases (92.2%) registered with the CSA are sole care. Child support assessments most commonly involve a single child—58.87% of cases registered with the CSA (CSA, 2004). 6 This is earned income net of Parenting Payment Single, the low income and pensioner tax offset, income tax and Family Tax Benefit, taking into account the Maintenance Income Test. The non-resident parent is assumed to have zero supplementary income. 7 The amount of NewStart Allowance was the maximum rate as of 20 March 2004 for a single person over 21 years (Australian Government, 2010). Average weekly income of child support payers is sourced from the CSA (2004). Median male weekly total earnings are for all occupations (including managerial employees) in May 2004 (Australian Bureau of Statistics [ABS], 2004). High income is defined as the top 20th percentile of male weekly total earnings for all occupations in May 2004 (ABS, 2004). The source for average weekly hourly earnings is ABS (2004). 8 The kink in the schedules displayed in Figure 1 occurs at $44,656 rather than the disregard amount of $38,168. 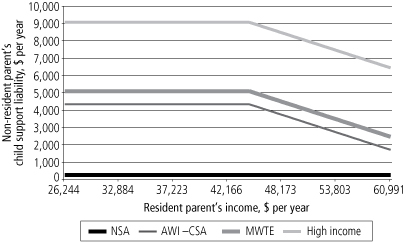 This is because the horizontal axis describes resident parent income net of tax and transfers. 9 Provided that this change in hours doesn’t increase their income above the payee disregard. 10 In this report, we do not consider the role that the payee disregard might play in changing the financial returns that accrue from an additional hour of work; that is, the substitution effects that this might generate. This report addresses the question: Do child support payments influence the labour supply decisions of resident mothers? The related, but distinct, questions of the extent to which the administrative child support formula is responsible for the distribution of labour supply that is observed and what the consequences for the labour supply incentives of changes to the formula might be are beyond the scope of this report. 11 Here, we are comparing the return to work of women who receive child support payments determined by the child support formula who move from hours worked at the payee disregard in Figure 2 (see page 6) to some number of hours worked to the right of the payee disregard at a given wage rate.